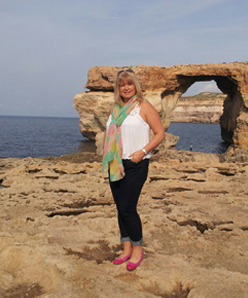 I’ve been at Premier Travel since 1985 – I was based at Rose Crescent (now Sidney Street) for 23 years, then I had a brief break during which I worked for a private aviation company and for the United Nations as a travel administrator, before moving house to Ely. Then I came back to Premier Travel and have been based at Ely since 2013. Because it’s my passion for something I’ve always loved – When I had a 4 year break from retail I realised how much I missed doing it. Extensive European cities; Istanbul, Vienna, Salzberg, Prague, Rome, Paris, Amsterdam, Dublin, Milan, Venice, Palma, Nice, Barcelona, Bruges, Majorca, Malta, Greek Islands (too many to mention), Portugal, Madeira, Switzerland - various parts. Lots of USA: New York, Boston, Los Angeles, San Francisco, Florida, Chicago. Canada: The Rockies & Vancouver Thailand, Barbados, Granada, Dubai Cruises: lots of the Mediterranean such as Greece and Portugal with lots of different cruise lines, I’m going to the Norwegian Fjords in April on my honeymoon too. Sani in Greece and Kefalonia. Hawaii – it’s somewhere I’ve always wanted to see, mainly due to the idyllic white sand. It seems like a very unspoilt island, it looks so tranquil and very pretty. I’d want to do a three week trip and combine it with San Francisco. Canada for the scenery, wildlife, snow and atmosphere. I went in the snow for 10 days and it was beautiful, they have such breath-taking scenery. Greece is also one of my favourites and I’ve been to loads of the Greek Islands – Sani Resort in Halkidiki is top of my list, the beach and food are incredible and I’ve been back every year for the last five! At Lake Louise in Canada with my fiancee, it was minus 26 degrees and we were walking around the lake at dusk, we stood in silence for a moment just listening to the wolves howling from the distance – it was incredible. Use your imagination; try and look at places you haven’t been before and challenge yourself. I’m honest, realistic and reliable! An emergency credit card for unexpected shopping trips and a pair of comfortable shoes!